Aluminum and steel are two metals commonly used as fencing material. While both are attractive and long-lasting, there are some significant differences between the two. Read up on the facts about aluminum and steel fences to see which one is the right choice for enclosing your property. 1. Aluminum is one of the most corrosion-resistant metals. It will never rust, crack, peel, or bubble. Not only does aluminum stand up to the moisture generated by rain, snow, and lawn sprinklers, it is not affected by lawn chemicals or salty beachfront air. 2. Aluminum is malleable, meaning it can readily be shaped into decorative designs. 3. Aluminum fences can be welded, rather than screwed or bolted, for strong joins. 4. You will find aluminum fencing sold in a number of colors, including black, white, and various earth tones such as browns and beiges, in either matt or gloss finishes. You can also paint it after installation, although this is a more complicated process than painting, say, a wood fence. 5. Aluminum is lightweight, making this material super easy to ship, to transport to your site, and to install, even as a DIY project. It is also uncomplicated to repair. 6. The drawback of aluminum's light weight is that it has low impact resistance and can be easily bent, dented, or otherwise damaged. It is not ideal for regions that experience heavy storms. 7. Using an aluminum alloy will improve its strength but also add to the fence's weight and often reduce its resistance to corrosion. 8. In terms of maintenance, untreated aluminum tends to develop an unsightly patina, which should be periodically removed. Otherwise, care of your aluminum fence will consist of a simple hose down to remove dust and dirt; you may want to apply soap to remove grease and stubborn grime. 9. Aluminum is extremely long-lasting, a fact which is reflected in the lifetime warranty usually offered on aluminum fencing. However, if you decide to replace it at some point, the metal is 100 percent recyclable. You can also buy good quality used aluminum fencing. 10. Some of the best uses for aluminum fencing are: privacy fence, marking your property borders, swimming pool enclosure, decorative garden fence, and keeping animals such as small pets or chickens inside. 11. No other fencing material is stronger than steel fence. Add to this the fact that the joins in steel fencing are normally welded together rather than connected with screws and you've got a super tough fence. 12. Steel is, however, vulnerable to corrosion, especially from salt water. Galvanization (application of a thin layer of zinc) and powder coating will alleviate this problem, but at the same time will increase the cost. 13. Even if it has a protective coating, steel fencing will require regular maintenance in the form of sanding and painting. Application of rust-inhibiting primer before painting is advisable. 14. Steel is heavyweight, making it more expensive to ship and more difficult to work with. It also comes with a limited number of styles and a higher installation cost. 15. Tubular steel -- fencing made from hollow steel bars -- is still strong but lighter weight. Easier to work with, it is also ideal for gates in high traffic areas. 16. Steel fences tend to be harder to repair than those made with other materials. 17. No-longer-needed steel fencing may be recycled as scrap metal. 18. Some of the best uses for steel fencing are: children's play yard fencing, security gates and fence, enclosures for large dogs and other animals, and fences for commercial premises. 19. 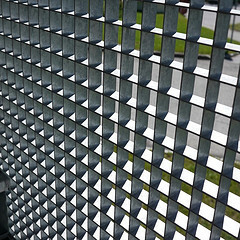 The cost to install either aluminum or steel fencing depends on several factors, like height, length, the number of fence posts, the number and style of gates, additional components such as post caps, and labor. Contact a reliable contractor near you to plan your fencing installation. 20. It is essential to check out your local zoning laws and building code (and pool safety code, if applicable) before planning to install a fence.